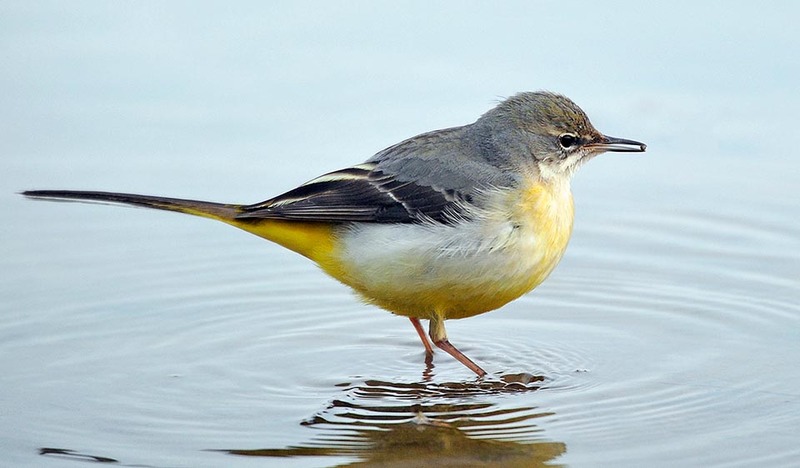 The Grey wagtail (Motacilla cinerea Tunstall, 1771) belongs to the order of Passeriformes and to the family of the Motacillidae and is practically the yellow copy of the white wagtail (Motacilla alba). For the truth, it would have been better to call it grey wagtail as well have done the British, good connoisseurs of avifauna, rightly calling it with such name and instead to call yellow the (Motacilla flava) that excels in this colour and that always the Brits have rewarded with the name of Yellow Wagtail. On the other hand also the scientific names with which have been classified, have proved that this choice should have been the most coherent with the etymology of the two names. The genus Motacilla has a rather imaginative origin typical of other times, as a matter of fact some would derive it from the Latin “motare” = to shake and “cilla”, medieval linguistic invention to indicate the tail whilst for the more classical interpreters it should come from the Greek name “muttex”, name used by Hesychius to indicate small birds linked to the aquatic life. Some, siding old Italian dialects, should derive it from “mota” = mud, declining it in the coaxing form. The specific name cinerea, deriving from the latin “cinis, cinereus” = ash or grey, as proof of what mentioned above and as confirmation of the colour of the back of this nice small bird. 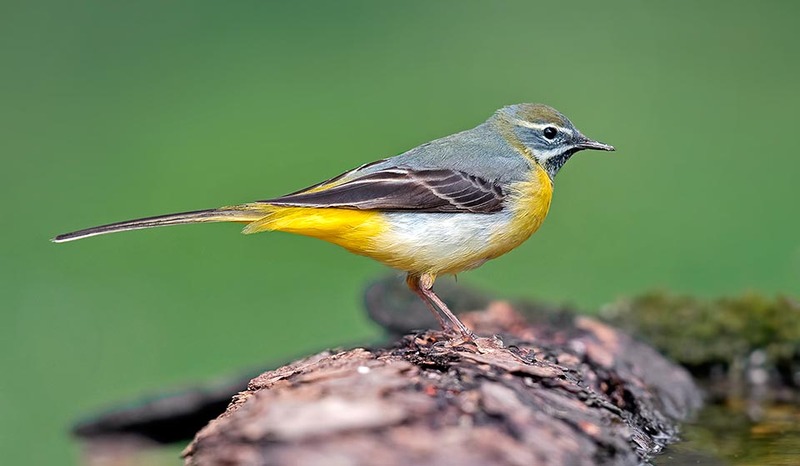 The grey wagtail is the typical companion of the mountain hikers, of the shepherds of the alpine huts and of the old water mills with running water ditches. There is no streamlet or water stream or even a small gurgling and stony rivulet which steeply descends from a hill that does not see the presence of this elusive little bird. Always hopping on the cobblestones that surface between the gurgling waters, here it is suddenly taking off a few steps far from the passing by and with the typical “zizzìp zizzìp” moving of some metres on another rock. At times, instead, it covers longer distances showing its particular wavy and light flight, like a real air dancer, though the same characteristic is shown also when on the ground. The grey wagtail is a bird living always on the ground continuously looking for insects, fairly walking with elegance, with fast and sensual movements, with quick jumps and short chases, wagging continuously its long and disproportionate tail so thin to seem a dummy appendix instead of a natural extension given by nature. So long to be friendly called in the Canary Islands, “veleta” = weather vane, as it moves it continuously. Surely, the Italians giving it the vulgar name of ballerina have certainly guessed one of the most evident characteristics of its behavior. Conversely, in the other European languages they have pointed out in its names the characteristics of the frequented sites or the colours of its livery. 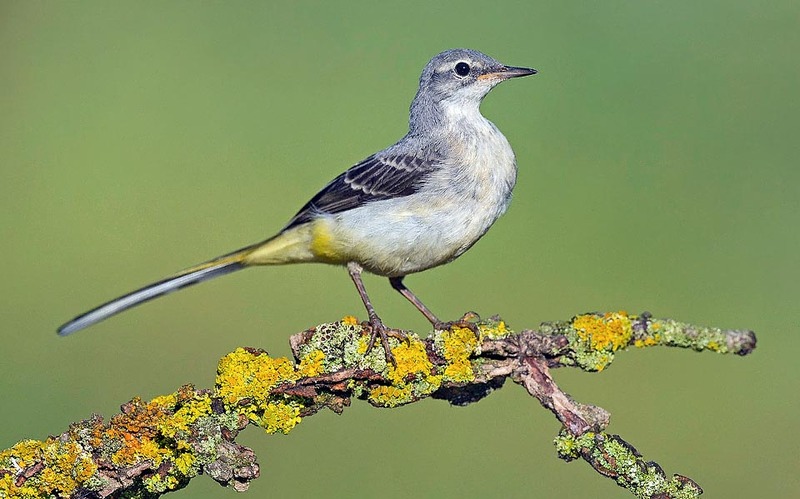 As a matter of fact, it is called Lavandera cascadeña in Spanish, Bergeronnette des ruisseaux in French, Gebirgsstelze in German, Alvéola-cinzenta in Portuguese and Grey Wagtail in English. 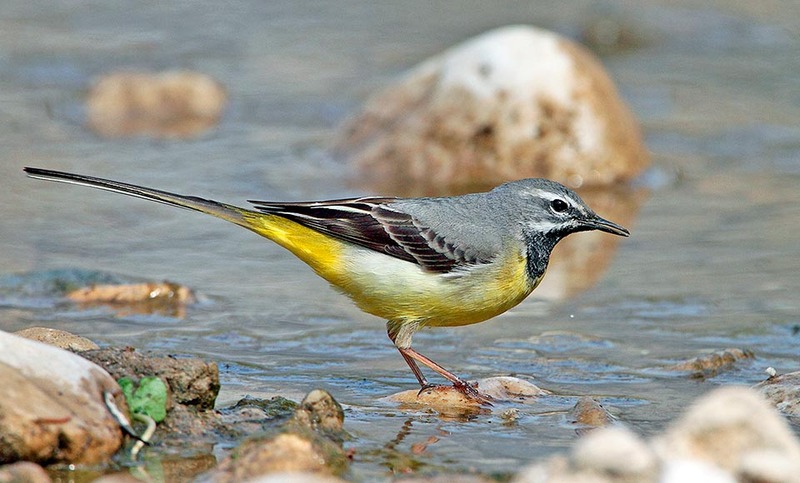 The distribution range of the grey wagtail is extremely vast and covers almost completely Asia as well as Europe. North, it reaches average high latitudes occupying partially the northernmost part of our continent and in parallel passing from Siberia up to the coasts of the extreme east. European Russia is strangely missing of populations that instead start again in a continuous and constant way from the Ural mountain range up to the coasts of Pacific. South, it occupies the European Mediterranean area with as limit the eastern part of the Balkan peninsula to then start again from the plains of the Caspian Sea, Anatolia, up to Iran and passing north of the Himalayan chains up to Mongolia and northern China. Is present also in Morocco and in many Macaronesia islands. Many of the populations located in the northernmost quarters are regular migrants and during the winter they abandon the ranges of nesting occupying the territories placed more to the south in the same continent or even in more distant places, located thousands of kilometres far away. This is the case of the north and central Asian populations that appear to be wintering in the tropical areas of the Rift Valley as well as in the Indian and Indochinese peninsulas and in all Indonesia. The European populations are normally sedentary even if the northernmost ones, under particular meteo conditions, are subject to movements even important while looking for milder climates. However, also those considered as sedentary and faithful to their territory, are subject to short vertical movements that see them getting down from their mountain territories, where the temperatures and the snow cover would result unsustainable for their type of feeding and reach the underlying plains. A very usual place is the belt of the foothills resurgences typical to the European chains, where the water gushes and flows at milder temperatures. The preferred environment is the mountain one with ample meadows with low grass, few bushes, with outcropping stones and crossed by an infinity of small rivulets. Also the swirling rivers with emerging rocks and pebbles and with many places suitable for nesting, are much appreciated. An environment shared with two species of birds that unfailingly keep it company during the warm season: the wren (Troglodytes troglodytes) and the dipper (Cinclus cinclus). Also the White wagtail (Motacilla alba) can be found sharing similar environments but this last is confined to the part of the water streams near to the plain whilst the grey wagtail is exclusively mountainous. In fact, it reaches the 2000 m of altitude in the Alps, altitude that may double on the Asian chains. Once, the Motacilla cinerea was diffused in good number also in the plain but is now relegated mainly to old stone constructions on the edge of ditch, old mills, bridges and walkways in rocks covered by moss and ferns, levees of water ways and walls in rock, environments that slowly have disappeared from our countries due to the modifications of the cultivation methods as well as to the architectural tweaks done on these buildings. In Italy the species is considered as sedentary with winter overlapping of migration flows coming from the northern ranges. 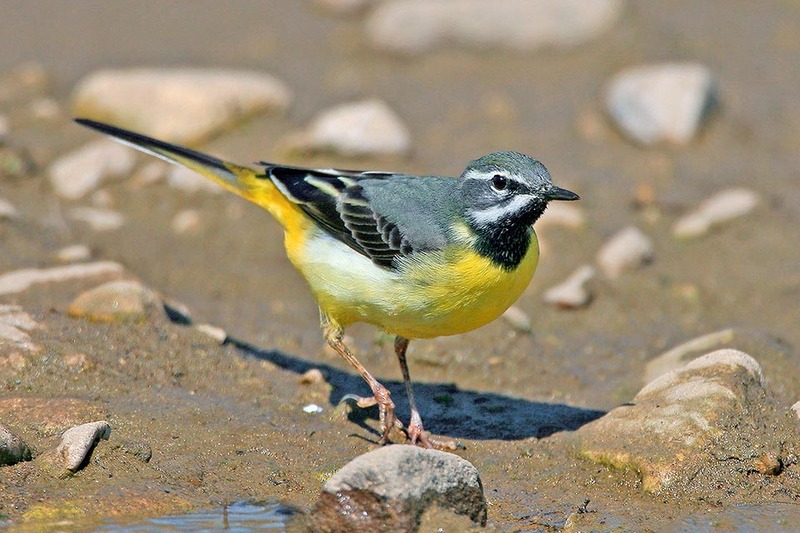 The grey wagtail is easily mistaken with the yellow wagtail (Motacilla flava) even if as a principle the habitats do not correspond as well as the periods when occur more probabilities of overlapping of the ranges. 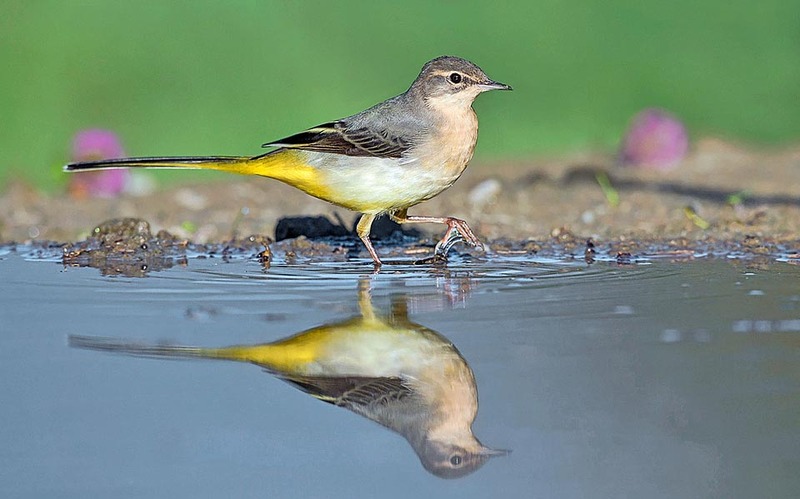 The yellow wagtail is a long range tireless migrant and comes to our places only in summer whilst our grey wagtail is mainly resident and sedentary. As previously said about the colour of the liveries, the yellow wagtail has a much brighter and more visible colouration than the grey wagtail. Also their character is well different: the grey wagtail is much more shy and grumpy whilst the yellow wagtail does not have any fear at all in showing up in open air even not far from the man. Nevertheless, the grey wagtail has a remarkable colour and so lively hues to be counted among the most coloured birds of our continent. All the lower part up to the undertail is completely straw yellow, at times tending to a pale shade of lemon colour, with a triangular spot very evident but not extended, of compact black raven colour, placed under the throat like a small gag. The cheeks are greyish and marked by two white lines where the lower one limits the gular spot and the upper one forms a showy eyebrow. The back and the rump are also greyish whilst the alar cover is more blackish and is barred by the outer barbs of the alar coverts that are white. In the female the black spot on the throat is replaced by a series of lined black little spots that form short vertical lines. In the non-nesting adults the throat is white whilst in the young all the livery is greyish and lacks almost completely of the yellow apart the undertail. The winter livery is much more modest in the colouration, missing almost totally of the spot on the throat, of the intense yellow on the lower part of the body and of the compactness of the grey on the alar cover. The tail, very long, thin and very mobile, has black central rectrices and the outer ones white, quite visible when flying. 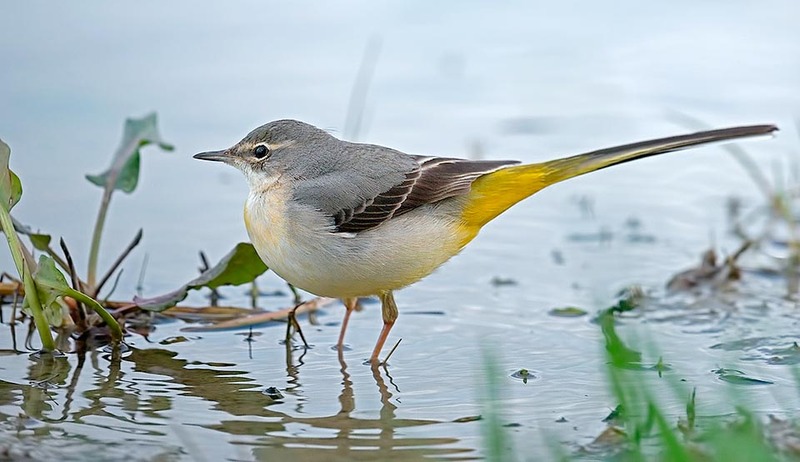 The tail of the grey wagtail is surely one of the longest tails among all the motacillids and in the adults exceeds often the 10 cm on a average length of less than 20 cm. The weight is 15-20 g and the wingspan is 28 cm. 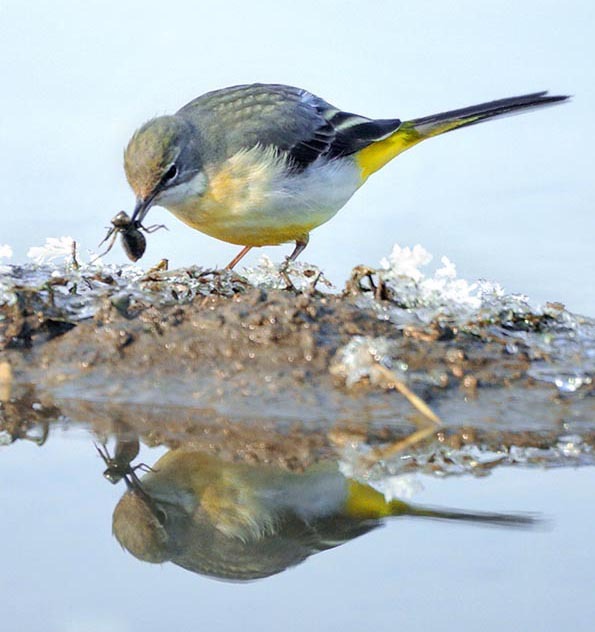 Despite being a polytypic species and having such a vast range, of the grey wagtail have been classified few subspecies among which the most particular relegated in isolated populations, remote and never in contact each other. 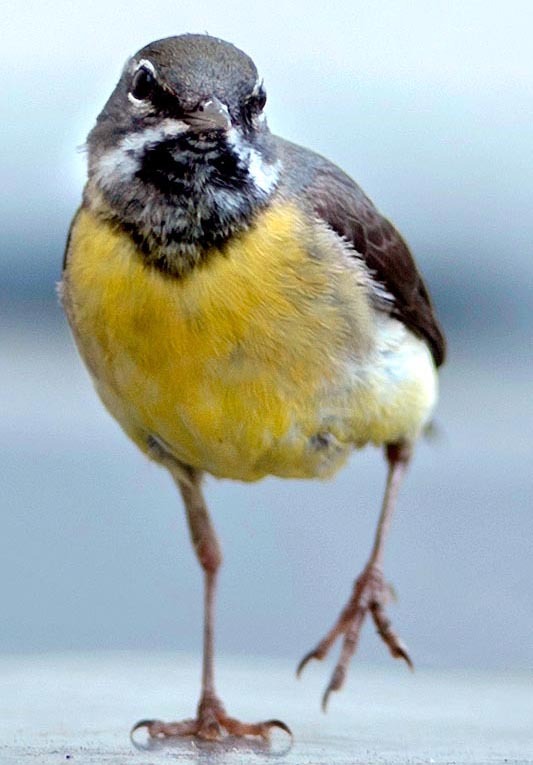 The Motacilla cinerea cinerea that is the nominal subspecies and whose population occupies the whole territory of the three continents involved, the Motacilla cinerea patriciae endemic to the Açores and the Motacilla cinerea schmitzi endemic to Madeira Island. 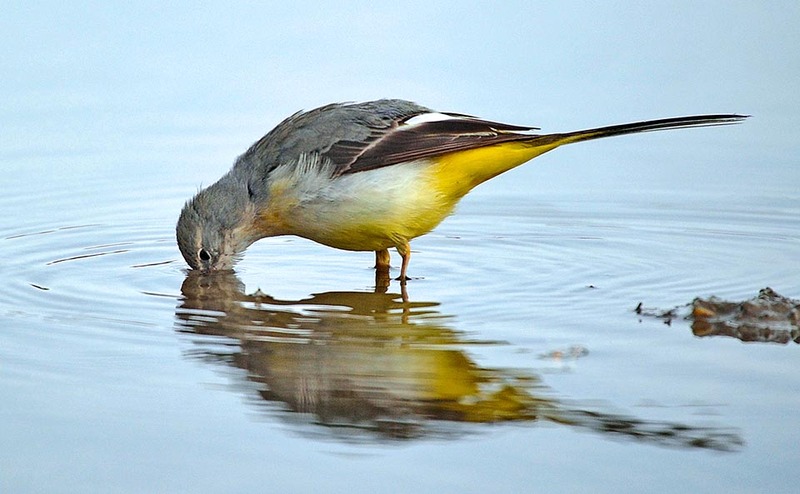 The grey wagtail is linked to the water and never gets far away from the same even less during the nesting period. It usually looks for a shelter facing the water stream, a grotto, in a rock even if placed well in the middle of the river, under the bridge of a brook, in a hole of an old dwelling bordering a ditch or even between the rusty mechanisms of the blades of the wheel of an old mill, or behind a small waterfall of a brook, but, wherever placed, the important thing is that the water must be handy. 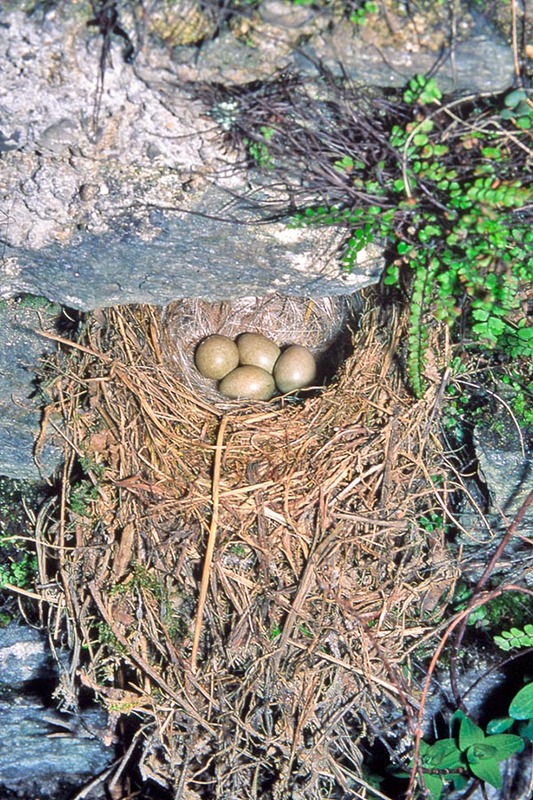 The nest is a mass of dried herbs, of stems and of moss and at times some small dried leaves, built by both partners where are laid 4 to 6 whitish eggs finely and slightly brown spotted. The brooding lasts about 12-14 days and is done by both parents. Two broods and possibly even three in a habitat with more reduced altitude. The chicks come to life featherless and blind and stay in the nest for a couple of weeks before flying off. For some days they will still depend on the parents that will care and protect them against possible dangers but soon they will get independent and will start an autonomous life. rambling and aimless routes just to seize some passing-by midge. It is natural that living in an aquatic environment it nourishes of larvae of hydrophilous insects, of caddisflies, of mayflies but also of small snails and worms that it catches from the surface leaning directly from the pebbles of the water stream and often dipping the head directly.